The development of the residential portion of the Back Bay achieved a high degree of architectural harmony largely as a result of detailed restrictions contained in the original deeds. These restrictions governed the buildings that would be constructed on the land being conveyed, and were binding on those who bought the land and on their successors. The deed restrictions varied by the entity conveying the land, and also evolved over time. They usually restricted the type of buildings that could be built to dwelling houses and their appurtenant structures, and limited the type of material that could be used to brick, stone, or other non-combustible material. They also specified the number of feet the houses were to be set back from the arterial (north-south) streets, and required a minimum height (limiting the maximum height was not a concern in this pre-elevator era). The deeds also sometimes included specifics requirements that party walls be centered on the property lines with the costs be shared equally among the owners (frequently, however, these requirements were imposed through subsequent deeds or individual party wall agreements between owners; click here for more details on party wall agreements and stipulations). The deeds from the Commonwealth included the most comprehensive restrictions, but the deeds from the Boston and Roxbury Mill Corporation and Boston Water Power Company included similar language. Most of the deeds required the restrictions to be observed in perpetuity; however, those from the Boston and Roxbury Mill Corporation contained a “sunset” provision ending the restrictions after several decades. Approximate location of lands owned by the Commonwealth of Massachusetts, the Boston and Roxbury Mill Corporation, the Boston Water Power Company, and the David Sears family, drawn on the block plan for the residential portion of the neighborhood as of 2015. The deeds for lands owned by the David Sears family did not include building restrictions. These lands were located on the south side of Commonwealth from a line mid-block between Exeter and Fairfield west to Massachusetts Avenue. After they were sold, the purchasers adopted agreements to require building restrictions similar to those in the deeds from the Commonwealth. The agreements for the blocks between Exeter and Hereford included both the south side of Commonwealth and the north side of Newbury. The agreement for the block between Hereford and Massachusetts Avenue, however, only included Commonwealth (the Newbury block being planned as the location for stables). The Commonwealth’s lands were administered by the Commissioners on Boston Harbor and the Back Bay (which became the Commissioners on the Back Bay in 1855, the Commissioners on Public Lands in 1861, and the Harbor and Land Commission in 1879). The setback requirements applied to the streets running east-west: twenty feet on Commonwealth Avenue, and twenty-two feet on all other streets except the south side of Boylston, where they were twenty-five feet. There were no setback requirements for the streets running north-south, presumably on the assumption that all corner houses would be built fronting the east-west streets. When several houses were built facing a street running north-south, they often were built by a single owner or building contractor who maintained a consistent setback (for example, 263–265–267 Clarendon/92 Marlborough and 9–11–13–15 Gloucester). In cases when more than one owner was involved, however, they sometimes included language in the land transfer deeds, or entered into separate agreements, requiring setbacks, limiting the depth of the houses, and establishing easements at the rear of the lots to ensure that all houses could have access to the alley or main street. Examples are the houses at 230–232–234-236 Clarendon and 277–279–281–283 Dartmouth. On November 27, 1858, the Commissioners voted to clarify that the prohibition on stables would not be enforced “in such a manner as to prevent the erection and use of private stables by gentlemen as appurtenances to their own dwelling homes; provided, such stables are so constructed and used as not to be justly offensive to the occupants of the surrounding buildings.” This clarification was subsequently published in the land auction catalogues issued by the Commissioners. The drawing to the left illustrates graphically the setback requirement of the 1863 (and later) deed restrictions. During the ensuing decades, most owners, architects, and builders respected the restrictions. However, there were periodic complaints, usually from abutters, about violations, most of which appear to have been resolved without legal action. The report observed that “it may be presumed that …violations occur oftener from ignorance, or inadvertence, or bad advice, than from deliberate purpose.” The report then restated the deed restrictions and published an extensive set of rules designed to further clarify the deed restrictions. 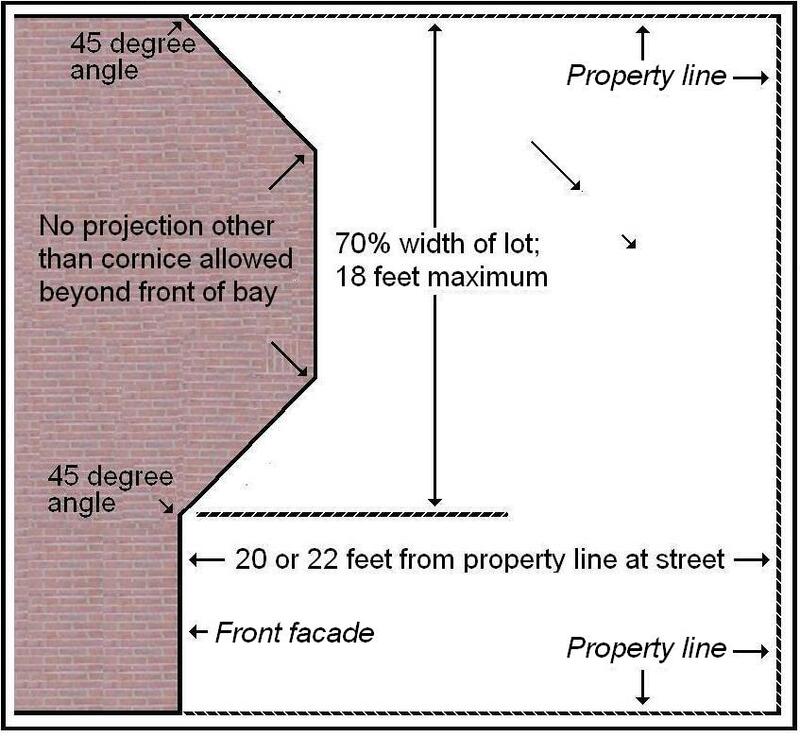 The primary areas of controversy as they affected the residential portion of the Back Bay were (a) the right of a property owner to maintain private stables, (b) the extent and nature of building “projections” permitted into the reserved area created by the mandatory setback from the street, and (c) the extent to which bay windows and other structures projecting into the passage-ways (alleys) interfered with the obligation that they be kept open and maintained by the abutters. On the subject of stables, as noted above, the deed restrictions contained language prohibiting stables, but in 1858 the Commissioners had stated their intention that private stables would be permitted but that public stables would not. In about twenty of the earlier deeds, the phrase “except a private stable” was added; all of the rest of the deeds contained the absolute prohibition, but the auction catalogues for the land included the 1858 clarifying language. The right to maintain a private stable was challenged in several cases, among them objections to stables built by Samuel Hooper at 25-27 Commonwealth and by James Case at 120 Commonwealth. In each case, the right to maintain a private stable was upheld. In the case of William Beals v. James B. Case and wife (138 Mass. 138), William Beals was the owner of 125 Newbury, directly across the alley from 120 Commonwealth. He asserted that the deed restrictions clearly prohibited stables and that he was unaware of the 1858 policy adopted by the Commissioners allowing stables for private use, having purchased his land from a previous owner and never having seen the original auction catalogue issued when the land was sold by the Commonwealth, in which the 1858 policy was stated. In its decision dismissing his complaint, the Supreme Judicial Court ruled that when he took his deed, he was “bound at his peril to ascertain” the “circumstances and surrounding facts with respect to the land he was purchasing” and that the note in the auction catalogue was “a public declaration by the Commonwealth, intended to notify all purchasers of the scheme and purposes of the grantor.” In commenting on the decision in its 1885 Annual Report, the Commissioners on Harbor and Lands noted “the case may probably be considered as decisive against the right in equity to restrain the proper us of buildings as private stables, as between all parties holding or deriving titles under” deeds acquired from the Commonwealth through auction. The Commission and the courts were more circumspect with respect to structures which projected into the reserved area protected by the setback requirements in the deeds. Notable violations in the residential portion of the Back Bay which ultimately resulted in court action occurred at 16 Marlborough, 17 Commonwealth, and 217 Commonwealth (the Algonquin Club). Each of these cases turned on the extent of the encroachment on the reserved area and whether the builder had been given fair warning that his structure violated the restrictions. And in each case, the builder was required to modify a completed building to bring it into compliance. In 1865, John Mixer built a house at 16 Marlborough which included a bay almost the entire width of the house with a porch extending to the west on the same plane as the front of the bay, topped with a balustrade. On the western side, the porch area extended out beyond the stairs of the neighboring house to the west at 18 Marlborough and had a window looking onto the neighbor’s stairs. In October of 1866, after unsuccessfully attempting to convince John Mixer not to build 16 Marlborough in this manner, the owners of 18 and 20 Marlborough — Miss Ann Duncan Torrey and her sister, Mrs. Sarah Parker (Torrey) Linzee — brought legal action to compel compliance with the deed restrictions by John Mixer and by Mrs. Marianne (Mason) Crafts, who had purchased the house by early 1866. In March of 1869, the Supreme Judicial Court agreed, ruling that “the plaintiffs are entitled to relief as prayed for” and sending the matter “to a master to consider and report in what form and manner the relief can be given with the least detriment to all parties in interest.” Ultimately, the front of the house was rebuilt. Linzee v Mixer (101 Mass. 512). In 1866-1867, William Howard Gardiner built a house at 17 Commonwealth, the front wall of which was set back the required distance from the street but which also included in front of the house a structure three and one-half feet high, extending from the front wall of the house to the street, the top of which was covered by turf and the interior used for coal bins. After complaints from the abutters, in June of 1867, he was requested by the Commissioners on Public Lands to remove the structure extending into the reserved area or otherwise make it conform with the deed restrictions. He did not do so, and In August of 1867, the Attorney General filed legal action. In May of 1875, the Supreme Judicial Court ruled that “so much of it as rises above the usual line of the reserved spaces in front of the houses on Commonwealth Avenue must therefore be removed within a reasonable time.” Attorney General v. William H. Gardner (117 Mass. 492). 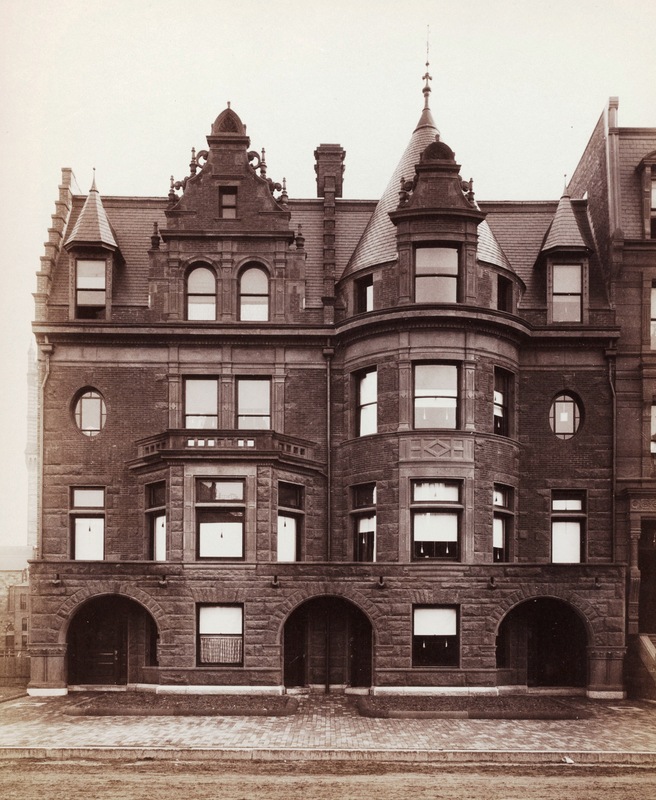 In 1887-1888, the Algonquin Club built its clubhouse at 217 Commonwealth, the street level story of which projected across the entire front of the building, connecting the area between the bays the east and west ends of the building with the central portico. This street level was one story high, with balustrades above to create a balcony accessible from the first floor stretching across the center of the building, between the two flanking bays. In September of 1887, the Harbor and Land Commission informed the Club of this violation, but it proceeded to complete the building without change. In June of 1888, the Attorney General filed legal action to secure the Club’s compliance. 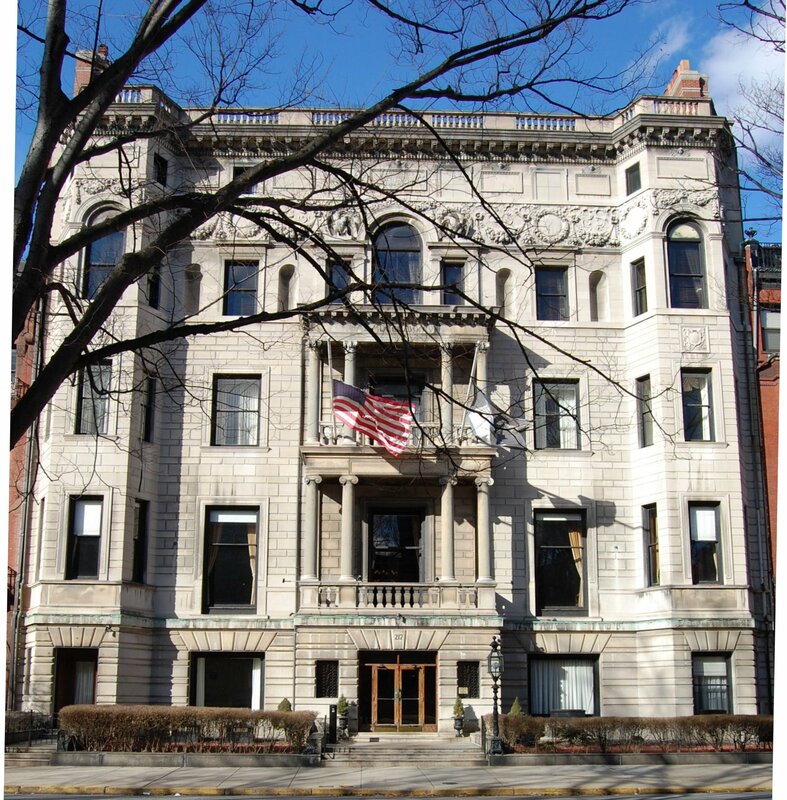 In April of 1891, the Supreme Judicial Court ordered that the building be remodeled to comply with the deed restrictions (Attorney General v. Algonquin Club; 153 Mass 447). The front of the building was subsequently rebuilt accordingly. Not every complaint that a structure encroached into the reserved setback was resolved against the building owner, as complaints involving 26 Exeter and 176–178 Commonwealth illustrate. 26 Exeter (ca. 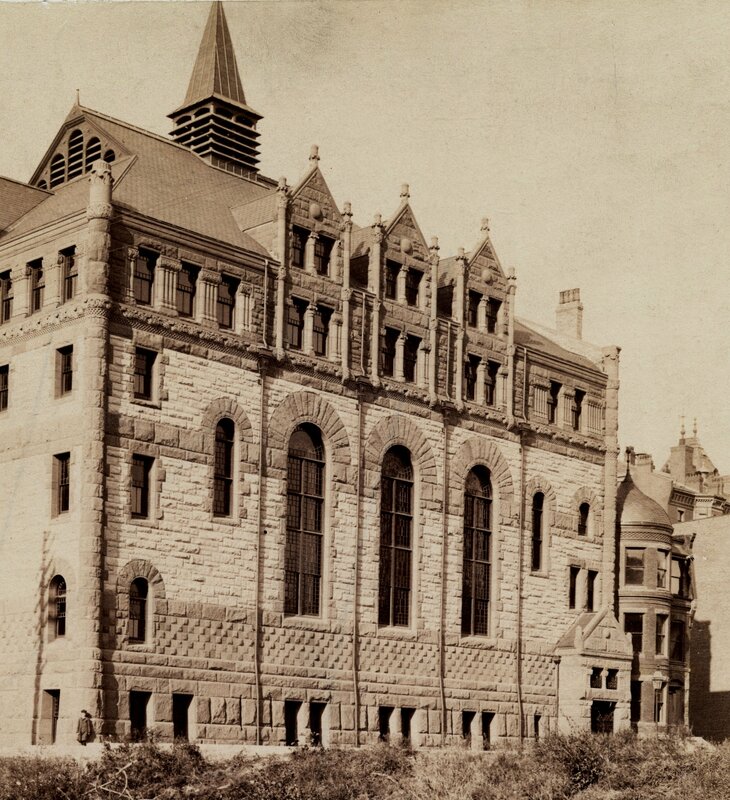 1885), detail from photograph by F. A. Tremaine, showing porch on Newbury façade; Ryerson and Burnham Archives, The Art Institute of Chicago (Digital file #43950). In 1883-1885, Marcellus Seth Ayer, on behalf of the Working Union of Progressive Spiritualists, built the First Spiritual Temple at 26 Exeter. 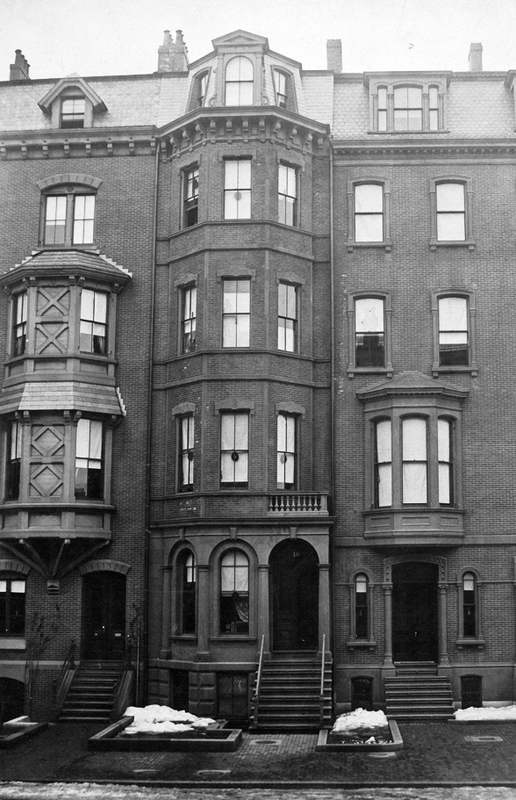 It included a stone porch on the Newbury Street façade, at the east end of the building, with solid walls projecting at right angles to the front wall into the reserved setback area. The Harbor and Land Commissioners brought legal action to compel removal of the porch. At issue was whether a porch qualified within the meaning of the term “portico and other usual projections” as used in the deed restrictions. 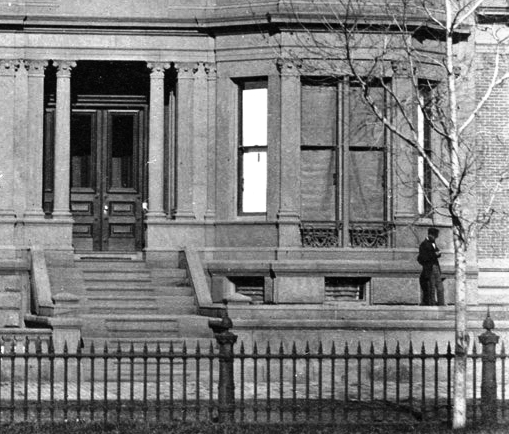 In February of 1889, the Supreme Judicial Court dismissed the complaint, concluding that the meanings were sufficiently consistent and that the permission to construct projections into the reserved area “extends to more serious structures, with closed sides, and therefore there is no reason for excluding porches.” Attorney General v Marcellus S. Ayer and others (148 Mass. 584). In 1883-1884, Dr. James Batchelder Bell and Dr. William Palmer Wesselhoeft built houses at 176 and 178 Commonwealth, a symmetrical pair, 176 Commonwealth with a bay on the west and 178 Commonwealth with a bay to the east. Each house had two front entrances, one on the outer side of the front façade, for use by the residents, and the other on the inner side, where the two houses joined, for use by patients. 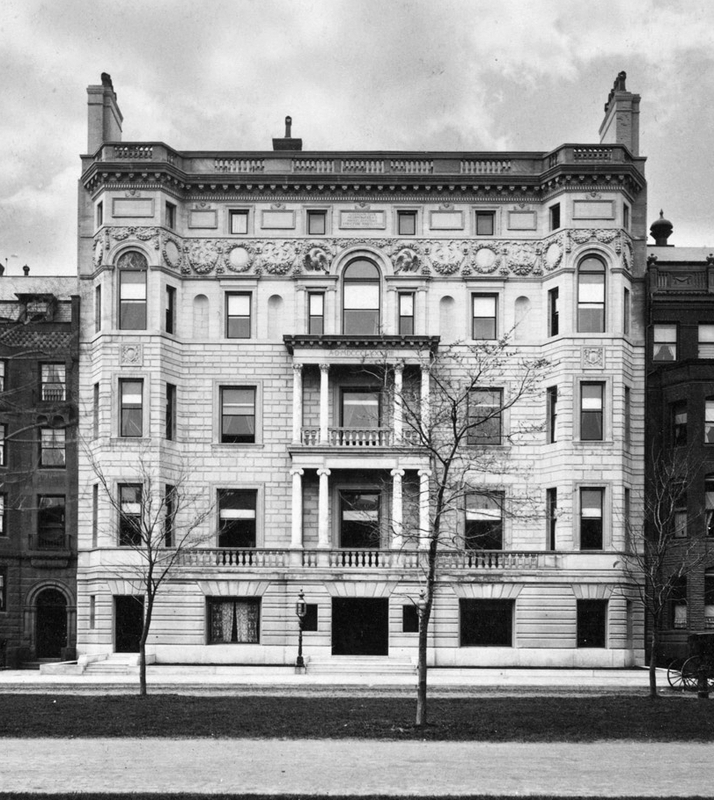 The porches to the entrances were enclosed and fronted with three arches (the two entrances to the medical offices sharing the center porch and arch) with windows in the bays between the arches, creating a continuous plane across the entire front of the two buildings, similar in appearance to the Algonquin Club design rejected by the court in 1891. In the early 1890s, Dr. Henry Orlando Marcy purchased 180 Commonwealth and in October of 1893, he filed a complaint alleging that 176-178 Commonwealth improperly encroached on the reserved area. In 1894, the Harbor and Land Commissioners ruled that it did not and that the houses did not need to be modified. The Commissioners concluded that each arched entrance was an allowed portico within the meaning of the deed restrictions (unlike the original design of the Algonquin Club, where the structures between the bays did not serve as an entrances), The Commissioners noted that the concern about 176-178 Commonwealth arose only because they each had two entrances, and “if the doors to the doctors’ offices did not exist, and the projections over them, being no longer porticos, were removed, the nature of the construction would resemble that of a large number of houses on the Back Bay on land similarly restricted.” They concluded that nothing in the deed restrictions prevented a house from having two entrances and “if a house has two front doors, there must be a right to have a portico over each, so that the extension of the projections along the whole front of the building by the conjunction of the bay window with the two porticos may be said to be an incidental result of the exercise of a permission expressly given.” The Attorney General subsequently concurred with this conclusion and no further action was taken. The third area of conflict was the extent to which the deed restrictions requiring that the passageways be “kept open and maintained by the abuttors (sic) in common” prevented bay windows and other projections into the passageways (alleys). This issue was raised primarily in the non-residential portion of the Back Bay, but nevertheless had implications for the entire neighborhood. 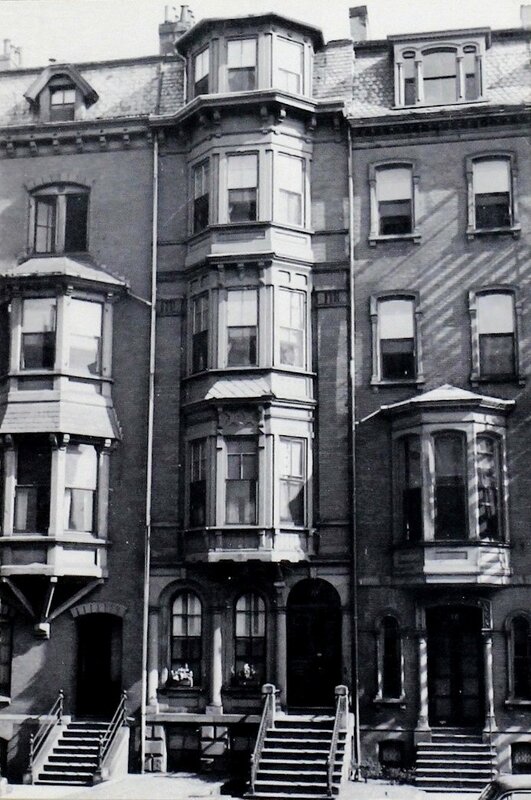 In 1884, Henry Bigelow Williams began construction of the Hotel Kensington at the northeast corner of Boylston and Exeter, and proposed to install bay windows projecting into the alley behind the building. In April of 1884, the Commissioners notified Mr. Williams that the windows would violate the deed restrictions. He proceeded to construct the windows and in May of 1884, the Attorney General filed legal action to compel removal of the windows. In June of 1885, the Supreme Judicial Court found that “a passageway sixteen feet wide was not merely to be kept open at the ends, but open to the sky throughout its entire length, for the general convenience and benefit,” and ordered that the bay windows be removed. Attorney General v Henry Bigelow Williams (140 Mass. 329).